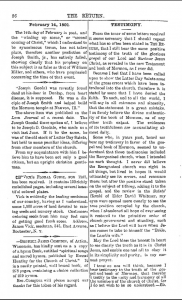 In 1876, the Church of Jesus Christ of Latter-day Saints published a revised edition of the Doctrine and Covenants which included, for the first time, section 130. 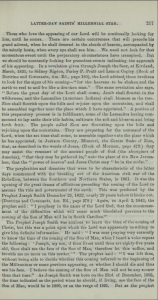 This section includes the founding leader Joseph Smith’s prophecy that if Smith lived “until thou art eighty-five years old, thou shalt see the face of the Son of Man.” In 1879, Apostle Orson Pratt added extensive cross-references and explanatory foot-notes for the publication of the English mission edition of the Doctrine and Covenants. 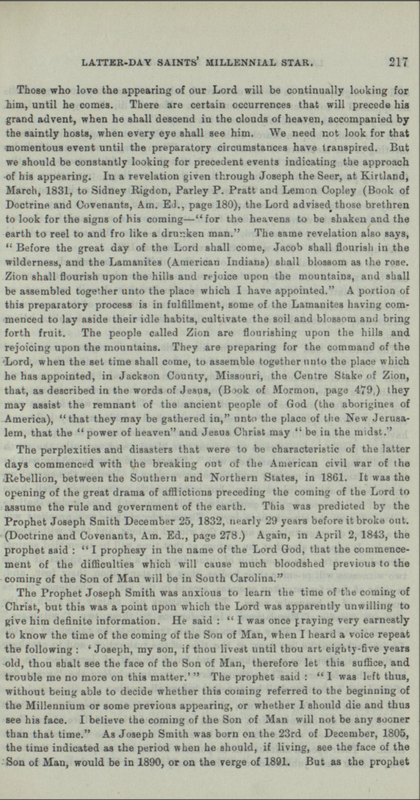 One foot-note Pratt added to section 130 was a “prophecy” from a meeting in Kirtland Ohio, on February 14, 1835, which is discussed below. 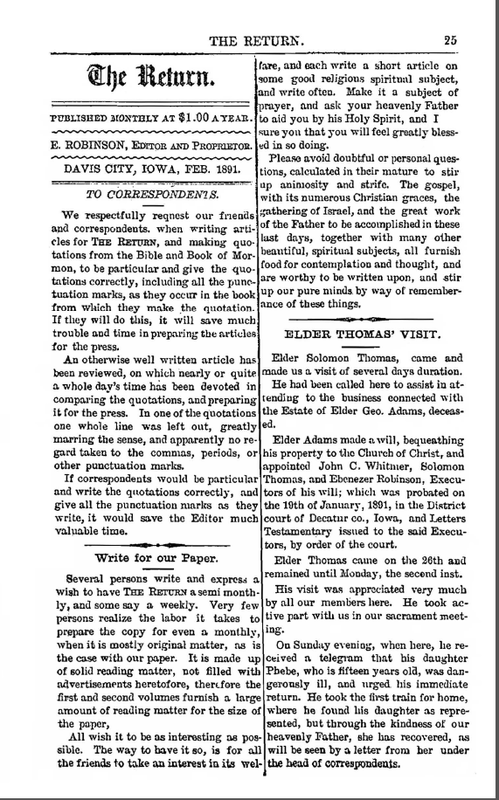 This edition was reprinted in Salt Lake City and then officially canonized at the October 1880 general conference of the Church. The timing of these changes in the Doctrine and Covenants should not be underestimated. 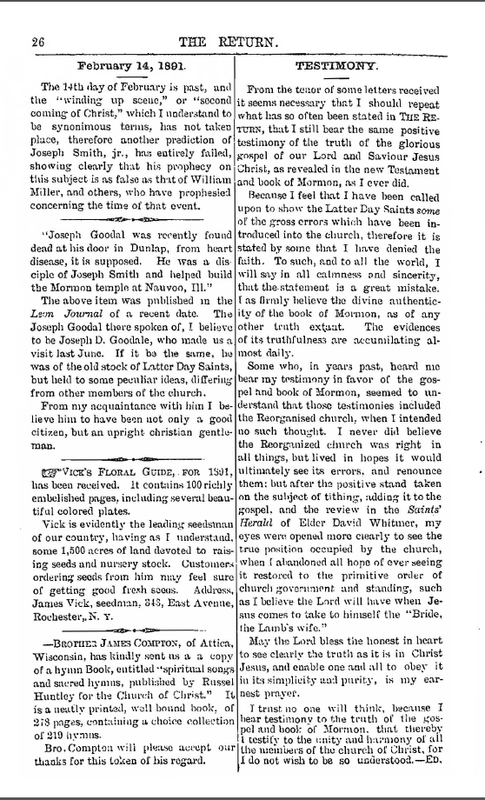 The belief in the second coming of Jesus Christ near Smith’s eighty-fifth birthday was very real for Utah Mormons, of the time, and it seems to have worked as a coping mechanism in the face of general “persecution” as they perceived it on several fronts, including the abandonment of the practice of plural marriage. 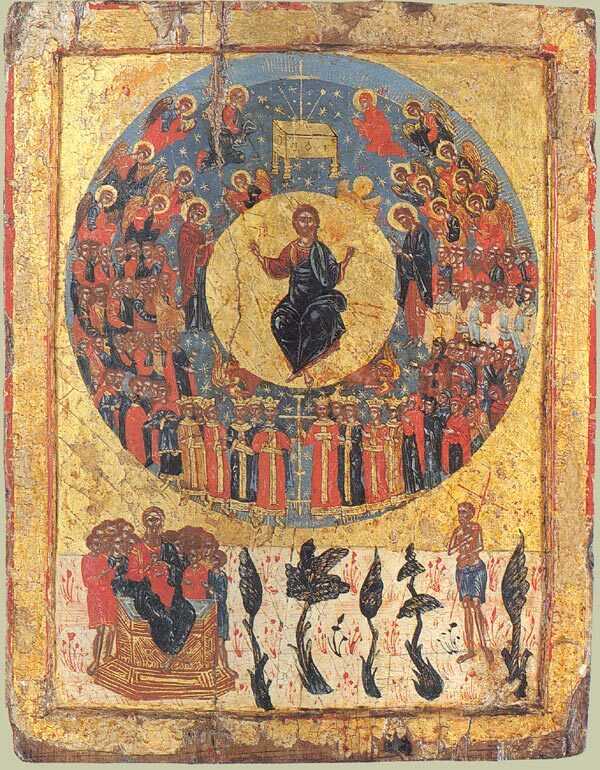 English Saints anticipate the coming of Jesus Christ. Former Nauvoo Mormon calls Smith a “false” Prophet. 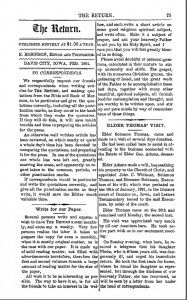 In the diary of future apostle Abraham H. Cannon , for October 14, 1886, is a record of a talk given by Apostle Moses Thatcher at Lewiston, Cache Co., Utah. 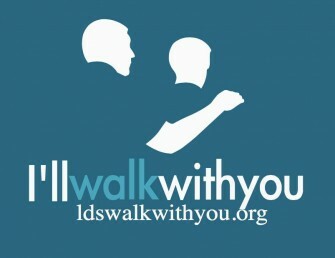 Most likely, Walker was not the only person in Utah who had to modify his world view. To early Mormons (as D. Michael Quinn said in his Sunstone presentation in 1990)14, two events had originally seemed unimaginable: that Joseph Smith could be murdered, or that plural marriage should end. 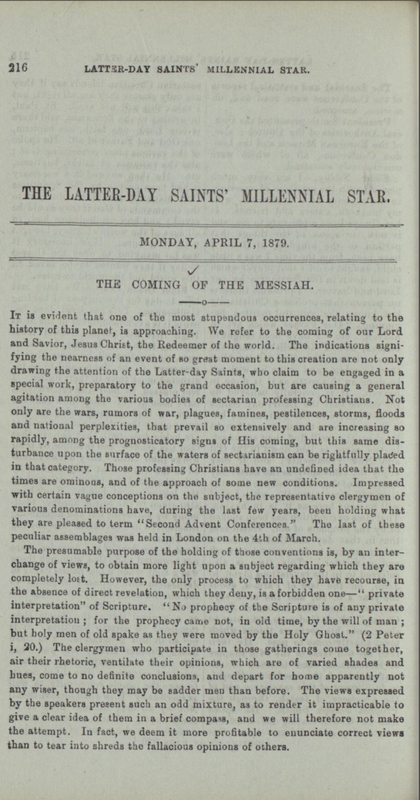 What might look to us today like a curiously specific expectation of an 1890-91 second coming of Christ – perhaps with a resurrected Smith at the forefront – appears to have given badly-needed hope to Latter-day Saints’ yearning for that event. A transient prophecy uttered by their first prophet, over half a century earlier, made their troubled times feel right – at least for a short while. 3 George D. Smith, An Intimate Chronicle: The Journals of William Clayton, p.95, For the Holograph Click Here. 5 Scott H. Faulring, An American Prophet’s Record, p.349, for the Holograph Click Here. JOSEPH GEISNER, together with his wife of more than thirty years, lives in northern California, where they provide residential services for people with developmental disabilities. He has published in the Journal of Mormon History, Sunstone magazine, John Whitmer Historical Journal, Irreantum, and on various LDS-oriented web sites. 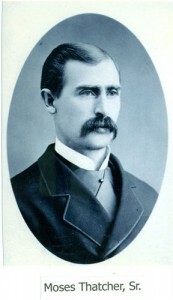 He has been an avid collector, reader, and researcher of Mormon history for most of his adult life. Joe this is great! Thanks for assembly all those quotes and sources in your witty way. I have noticed an increase in references the the last days in my own ward the past few years. 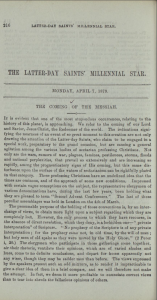 Joe’s conclusion that the belief in the eminent occurrence gave the saints some kind of hope to continue and to suffer through the persecution I think is accurate. I have often felt however that talk of the last days and the 2nd coming to a certain degree is a cop-out that relieves us of any responsibility to change things so that the 2nd coming can occur. I think the Lord is going to give us every possibility and even all the time needed to make things ready. We humans have a long to way to go to but we have changed a evolved a lot towards the ideals of zion and amy people get closer all the time. 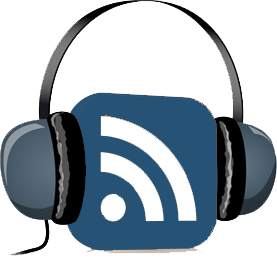 Great piece thanks!